Growing up, I hated mowing the lawn. My backyard was huge, my allergies were bad and I was stuck with a temperamental push mower. 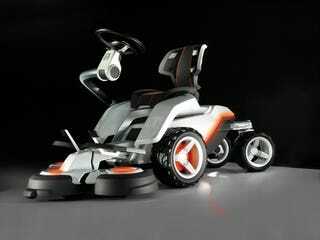 If I had this battery-powered Husqvarna mower, however, I would have begged to do yard work. The best part of this the Panthera Leo mower isn't the electric-powered design, or the recyclable materials it's made of. No, it's the LCD monitor and sensors, which work together to tell you what speed and height you should mow at, plus inform you when you're on too steep a hill or about to hit an object. And the mower lasts two hours on a single charge. Jalopnik says Husqvarna plans to put something similar into production within five years (basically, forever). But seriously, I would have driven this thing to school every day if I had one. Trust me. Oh, and check out more pics over at [Jalopnik].